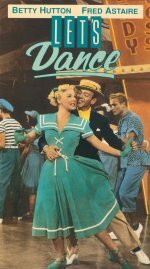 Let's Dance is a musical-comedy starring Betty Hutton and Fred Astaire. When ex-singer and dancer Kitty gets bitten by the showbiz bug again, she packs up her son Richie, escapes her wealthy family and absconds to New York. Unable to get a job, she is just about to give up and admit defeat when she bumps into Don, her old dancing partner. One of the least shown (hardly at all theatrically since its original release) of all Fred Astaire movies, and with some cause, though none of his films is negligible. Here, after his triumph in Blue Skies for Paramount, the maestro is inexplicably second-billed to the studio's blonde bombshell Betty Hutton. Watch for Astaire's stunning Piano Dance sequence, the minor Frank Loesser score and some nice Technicolor.